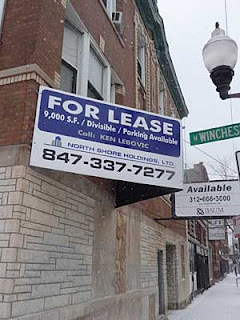 I am interested in opening up a restaurant at the property my family has located at the corner of Chicago and Winchester. The Winchester, at 1924 W. Chicago, will be an inviting establishment catering to the needs and demands of the neighborhood. The space will include an elegant and open layout with a large dining area, bar and a gourmet kitchen featuring food prepared by Chef David Gray and my mom. The sidewalk will be fixed up beautifully with the exterior of the building. Flat-screen televisions and music set our overall ambience. We are looking to cater to neighborhood functions as well as charitable events, so I am requesting an incidental liquor license from the city, along with a "public place of amusement" license. I need the PPA for fund-raisers in the dining/private room. To collect any cover charge or money you need that license. Also, I need a music controller/dj for some events or if there is a game going on where the TVs will all be on. During commercials music will be played. Usually there will be no sound on the TVs, just some music for the feel of the place. There will be no stage. Our concept will offer elements of casual dining featuring a flexible service model serving lunch, dinner and weekend brunch. This allows our patrons to choose among convenient dining options such as quick casual counter service, comfortable dining table service or even take-out. We will offer boldly flavored, made-to-order menu items. The Winchester target market is based on serving the immediate neighborhood area, the local business owner as well as families dining out. We will have valet parking. We want a variety of customers and will make sure everybody can enjoy The Winchester experience. This is a project that would hopefully be done by September if all goes well. We are excited about our project and have had great feedback from friends, residents, local businesses and the alderman’s office. We will be renovating our vintage property extensively to maintain the look and feel to blend in with the neighborhood appeal. My family and I are looking forward to serving you and creating a contemporary atmosphere for you to frequently enjoy. sounds great! about time they fill a store instead of losing another. I moved in the area 4 years ago and am pleased to see some change on Chicago Avenue. This is a definite must in our neighborhood. Get open soon for the Summer! Big concerns about the PPA License---glad I don't live near THAT~where is the parking lot that is usually required for a PPA. This is exactly what we need more of. I live at Wood and Iowa and am sick of walking down to Division for the same old thing. It would be nice to have several good restaurants on Chicago. Hopefully this one will be the catalyst.